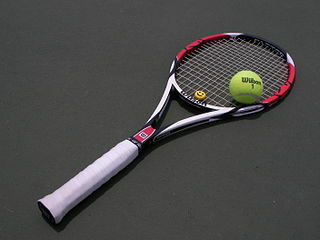 If you don’t follow tennis, you might not know that, this past weekend, Andy Murray became the first British man in 77 years to win the Wimbledon championship. He had tried to pull this off when he made it to the finals the year before. Then, as now, he had the talent. He had the strength. He had put in an enormous amount of work training with one of the best coaches in the sport. Just like this year, nearly the entire country was following the match on television. Crowds packed the pubs and gymnasiums of his hometown of Dunblane to hold viewing parties and cheer him on. Over three-quarters of a century of pent-up British hope sat on Andy Murray’s shoulders… hopes that were dashed when he lost in the fourth set. So what changed? How was this year different? I suspect the key was Murray’s mental game. He was noticeably more calm and composed this time. Mistakes and annoyances during the match seemed to more easily roll right off of him. He somehow found a way to shrug off the unfathomable pressure. Playing music is not much different from playing sports in this regard. You can practice the material. You can run your drills, etc. But even then, an untrained mind can sabotage your performance. Similarly, musicians can guard against pressure by focusing on their task at hand when performing. When your mind starts worrying about outcomes–whether you’ll pass the jury, or whether the club owner likes you enough to hire you again, or if anyone will remember that note you flubbed four measures ago–then you have stopped playing music. Are You a Frog in a Pot? 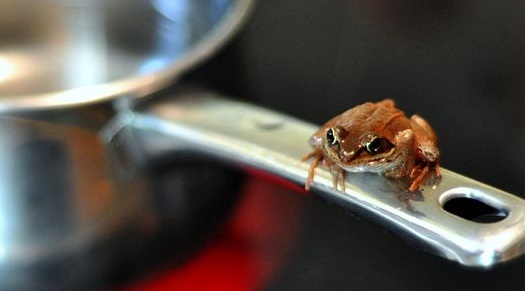 There’s an oft-repeated story–I’m sure you’ve heard it–about how, if you place a frog in a pot of boiling water, it will jump right out. But if you put it in pleasantly warm water and very slowly increase the temperature, it will allow itself to be boiled to death without so much as a “ribbit” of protest. This is most likely not literally true. But that’s okay. We’re more interested in the metaphorical truth of the story: It’s difficult to notice change when it’s gradual and slow. As musicians, we especially have to be on alert for this condition because it can hit us in two directions. The first direction is like our poor frog friend–we don’t see things deteriorating until it’s too late. Maybe it’s our playing skills that we let get a bit more rusty each year. Or maybe it’s the business/networking side of things. But as students of music (and we’re always students, ideally) it can go the other direction too. We often don’t notice ourselves getting better. Improvement happens notoriously slowly in music, and it doesn’t call attention to itself nearly as loudly as our inevitable mistakes and backwards steps. Here are two ideas. First, record yourself frequently. Not only does this help you improve faster in the first place, it also serves as an audio record of where you used to be. I cringe with embarrassment when I hear stuff I recorded years ago. That’s a good thing, because it tells me that I’m better than I was. Second, revisit old material from time to time. If you’re an accordionist, dig out that old copy of Palmer-Hughes book 1 and play “Vegetables on Parade” again. Or if you’re a Suzuki-trained violinist, you might run through “The Two Grenadiers” for old times’ sake. You get the idea. Remember how you used to bang your head against the wall over these? Hard to believe, isn’t it? Maybe you’re getting better after all.